MOORESVILLE, N.C. (March 2, 2016) – Kyle Busch Motorsports (KBM) announced today that second-generation driver Harrison Burton will make his NASCAR Camping World Truck Series debut for the team driving the No. 18 DEX Imaging/Konica Minolta Tundra Oct. 29 in the Alpha Energy Solutions 200 at Martinsville (Va.) Speedway. Burton, the son of 21-time NASCAR Sprint Cup Series winner and current NBC Sports broadcaster Jeff Burton, is currently competing for Rookie of the Year honors in the NASCAR K&N Pro Series East. The racing prodigy was a three-time USAC Quarter Midget national champion before moving into Late Models, where at the age of 11 he captured his first pole in the Limited Late Model division at Ace Speedway in Elon, N.C. At the age of 12, he graduated to Pro-Late Models and won two races at Dillon (S.C.) Motor Speedway. At the age of 14, the talented teenager became the youngest driver to win a NASCAR Whelen Super Late Model event when he visited victory lane twice during the World Series of Asphalt Stock Car Racing at New Smyrna (Fla.) last February and in May he picked up his first Southern Super Series win at Mobile (Ala.) International Speedway. Last October, at the age of 15 years and eight days, Burton became the youngest driver to compete in the NASCAR K&N Pro Series West when he raced in the series stop at All American Speedway in Roseville, Calif. In addition to his full-time schedule in the K&N Pro Series East this season, Burton will compete in numerous Super Late Model events around the country for his family-operated team. The 15-year-old driver returned to the World Series of Asphalt Stock Car Racing at New Smyrna this year and finished second in the Super Late Model point standings after collecting two wins and finishing inside the top three four times across the six-race schedule. He also posted a runner-up finish in January at 2016 SpeedFest at Crisp Motorsports Park in Cordele, Ga., against a field that included KBM owner-driver Kyle Busch and KBM Truck Series driver William Byron. Burton, who will be eligible to race at Martinsville after his 16th birthday on Oct. 9, joins a crop of talented young drivers already in the KBM stable. The team recently signed 15-year-old second-generation driver Todd Gilliland to a limited schedule for the team’s Super Late Model program and boasts three Truck Series drivers that are 21 and younger; Christopher Bell (21), Cody Coughlin (20) and William Byron (18). 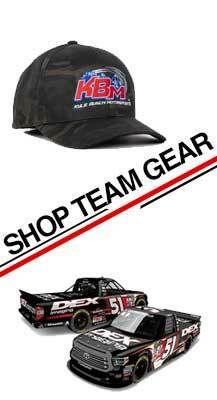 Kyle Busch Motorsports (KBM) has quickly established itself as one of the most successful teams in all of NASCAR. Owned by Sprint Cup Series champion Kyle Busch and fueled by his passion for winning, the organization has collected a Camping World Truck Series’ record four Owner’s Championships in just six seasons of competition and earned its first-ever Driver’s Championship with Erik Jones in 2015. The organization enters 2016 with a remarkable 45 Truck Series victories, including a single-season series’ record 14 wins in 2014. Sunoco Rookie of the Year candidates Christopher Bell and William Byron will each compete full-time in 2016 while Daniel Suarez and Cody Coughlin will share driving duties behind the wheel of the No. 51 Tundra. KBM prepares a fleet of race-winning Toyotas out of its state-of-the art 77,000-square-foot facility in Mooresville, N.C. Fans can stay up-to-date with all the latest KBM news online at www.KyleBuschMotorsports.com, by liking the team on Facebook (KBMteam) and by following the team on Twitter (@KBMteam), Instagram (KBMteam), and Google+ (+KBMteam). Konica Minolta, based in Tokyo, has offices in 49 countries across the world. The company was founded in 2003 after Konica and Minolta, two Japanese imaging companies, joined as one. Konica Minolta manufactures business and industrial imaging products, including copiers, laser printers, multi-functional peripherals (MFPs) and digital print systems for the production printing market. For more information about Konica Minolta, please visit konicaminolta.com. You can Like the company on Facebook by searching “Konica Minolta” and follow the company on Twitter at @KonicaMinolta. DEX Imaging is the nation’s largest independent dealer of Kyocera, Konica Minolta and Canon document imaging equipment. Headquartered in Tampa, FL, the company sells and services printers, copiers, fax units, and digital data management software. DEX Imaging was founded in 2002 with two objectives in mind – provide quality service and give back to the community. The company donates one third of its profits to charities and educational programs within the markets where DEX does business. For more information about DEX Imaging, please visit www.deximaging.com.